Atlanta Jobs with Justice would like to thank the over 250 people who came out to the SPEAK OUT FOR JOBS NOW on Saturday, April 2. Especially, thanks to the over 50 unemployed and underemployed workers who gave their testimonies. And the 25 service providers who provided free haircuts, legal services, massages, resume help, expungement support and more. Stay tuned a VIDEO is coming! Check out the TV coverage on WSB Channel 2--http://www.wsbtv.com/news/27409815/detail.html. Also, you can hear coverage on NPR today and in the Atlanta Voice this Friday. This is a beginning. Workers put forward their stories, exposed barriers and shared good ideas for solutions. 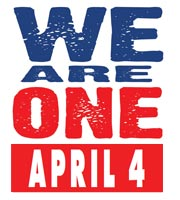 It will take us uniting together to bring about the change we need. Black, Latino/a, and White were all present. We must keep building, challenging racism and attacks on immigrants and fighting for the human right of everyone to a FAIR JOB, one with a living wage, a union and benefits! DON'T FORGET WE ARE MARCHING TODAY WITH WORKERS ACROSS THE COUNTRY. Fighting to stop the attacks on workers and people of color. And Fighting for FULL and FAIR EMPLOYMENT! 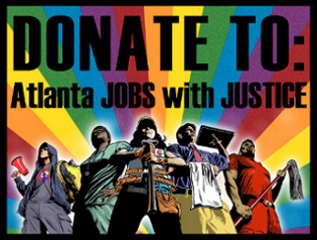 Look for the Jobs with Justice signs at the rally and come march with us!